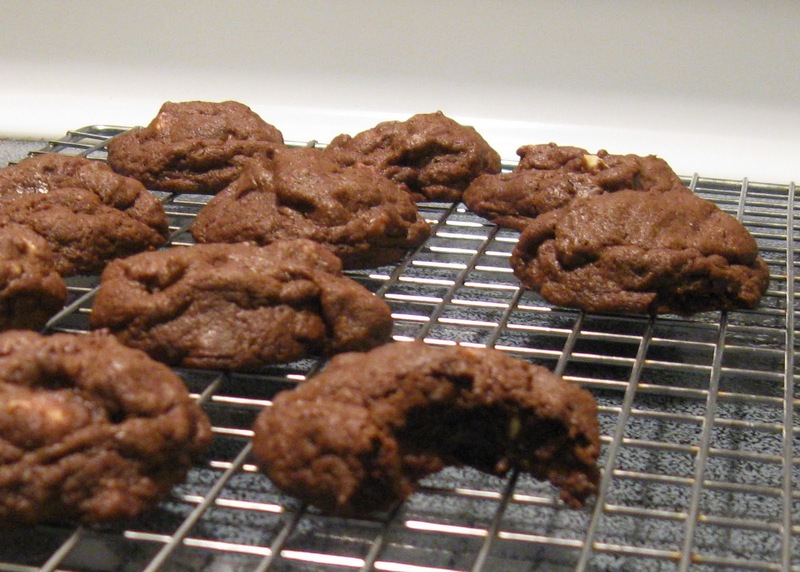 I had a hankering if you will for some Chocolate chocolate chip cookies. This is odd because I typically do not like cookies filled with multiple chocolates unless it is a standard chocolate chip cookie with different types of chips involved, yum! So I went on a search for a recipe I could play with. I found one here and then only changed one thing, tried to change something else, found out I did not like the results, and stopped :) I'm quick like that. So, I obviously need to purchase some pretty plates or something because the pictures on the stove are getting old. All I have is black plates and clear plates and neither are conducive for taking pretty pictures. Yes, so the recipe, I did not add the walnuts because I do not like nuts in my cookies although seeing as how they are optional that is completely okay :). I did on the other hand put in about 3/4 cup of dark chocolate chunks and 3/4 cup of white chocolate chips because I had them. They were very tasty. What did I do that I decided not to do after I did it? Well, I don't like cookies that looks like rocks, I like cookies that are more flat and soft and chewy. So...I decided to flatten some of the cookies but that just made them less soft and more crunchy so I stopped that and went back to my happy little soft rocks. Happy Baking!